The answer is YES – I managed to squeeze this in before Oscar night. It was OnDemand (and is now, obviously) JUST in time and I have never done Sunday chores so fast so that I would feel okay with plopping myself down on the couch in the middle of a gorgeous day to watch a movie with no lights on. All I can say is THANK THE LORD I did, because Argo made a dramatic swoop into the favorite slot on the list of nominees I got to see. (Still didn’t make it to Life of Pi, The Impossible or The Master). No kidding, I was really intrigued by this movie. Maybe it has a little something to do with the fact that I have a growing affection towards Mr. Affleck. Maybe it’s the joy I found in the fact that both John Goodman and Kyle Chandler got to make appearances in multiple Oscar noms. Or, maybe it’s the fact that The O.C.’s Jimmy Cooper is back in a semi-important role. Take your pick from a grab bag of reasons to get on board with this flick–anyway your draw, it’s pretty awesome. Enter Affleck’s Tony Mendez – an expert in the field of getting people home. He pitches a crazy idea that if he pretends to make a movie set in iran, he can pull off getting those 6 out as a part of his film crew. Here’s where the magic of this movie happens. A seemingly silly idea, with hair-brained success potential becomes a seat gripping, heart-pounding thrill ride (Batman, at Six Flags anyone?) of ridiculous capacity. 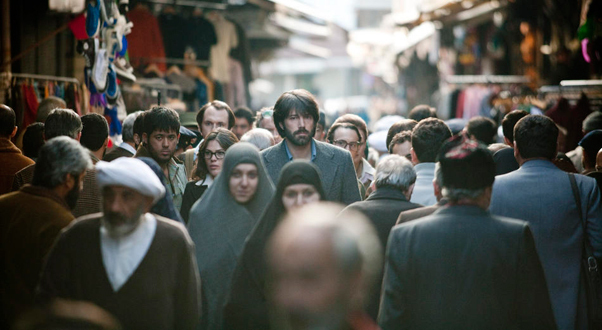 Because, not only do you find yourself rooting for this underdog of a story, but the essence of emotion that Director Affleck is able to capture from all of the characters, both in the US and in Iran is impeccable. I was doubtful, hopeful and scared all at the same time. It was crazy that something that couldn’t possibly work becomes a lifeline of hope in my mind as it plays out on TV. Okay, okay, this could have something to do with the fact that it’s a true story, so I know that the government really did try this, but that’s where Affleck deserves his due credit. It played out like an original. So much so, that I found myself heavy-gasp crying all alone in my dark living room (on a bright, sunny Sunday) with the overwhelming emotions that came towards the end. It’s such an intriguing concept. I’m really looking forward to seeing it.